Asante McGee: R. Kelly groomed me to accept his total control. I want people to understand, so it doesn't happen to anyone else. Asante McGee R. Kelly groomed me to accept his total control. I want people to understand, so it doesn't happen to anyone else. It's easy to say you'd never let a man do this to you. It's hard to leave if you don't recognize early on what is happening. When I was meeting him on tour, flying in and out of various places to be with him for two years, I only saw R. Kelly. I met Robert for the first time when he moved me into that house in Atlanta. I ran away after three weeks with Robert. For the years before that, I never saw anything that was a sign to me that he was abusive or controlling; I didn't notice the red flags. I thought, He is R. Kelly. He wants to protect me, so when he told me not to speak to people about coming to see him, because they might try to attack me, I believed him. He even had an example: He said that one of the girls he had been dating came to one of the shows — maybe in Houston or Dallas — and she mentioned to the Uber driver who she was dating, and she was attacked; they beat her up really bad, and put a gun to her head. He made it sound as if the Uber driver had someone on the phone, saying Hey, I got one of R. Kelly girls, and so I thought, given that situation, that he really trying to protect me by telling me to be quiet about him. I believed it then but, thinking about it now, I don't anymore. I think that the situation was something that he made up, so that I'd believe that his rules were made to protect me and not isolate me. I just didn't know any better. People keep saying, Oh I would never allow a man to do this to me. I would never this, I would never that. You never know what you would allow until you're put in that situation. I promised myself when I left my ex-husband that I would never allow another man to abuse me or mistreat me, and I ended up with R. Kelly, in the very situation I'd promised myself to avoid. I genuinely did not think that he would hurt me on purpose; I know now that he used my pain to his advantage. The first red flag that I truly ignored was when he flew me out to Chicago in 2016 but had me sit in a van for eight hours. I should have just left him then, but I was just so in love with him. And once he came and brought me to studio, he charmed me to the point that I forgot about what he had just put me through. R. Kelly thinks he's untouchable. Lifetime's 'Surviving R. Kelly' should mute the singer for good. I also never had any idea that he really liked minors; I was not a teenager, I was nowhere near a teenager. The only small red flag was that, when we were together, he always wanted me to talk like a little girl. He would tell me what to say, I would repeat it, and he would keep telling me "No. Do it different, do it a little softer," until I got to the voice that he wanted. I thought it was odd, but then I thought that maybe it was just a role play for him. But once I was in the house, I met a girl who I'd seen at a 2015 show in Connecticut; I remember seeing her sitting on his lap, and I thought then that she looked mighty young. But a lot of us looked younger than we really are, so I didn't question it then. Once I moved in, I learned that she was only 17 years old; that's when I started to get concerned. Being in the house, though, was also when I became very isolated. If I was alone in my room, I was able to use my phone to communicate, but I could not have my phone out in his presence, or in the presence of the other girls because he'd trained us to tattle on one another, to help him maintain control. For instance, before I lived in the house, I had gone to a concert; afterwards, we went backstage and he asked one of the girls "How did she do?" I was confused, and then one of the girls say, "Oh Daddy, she did great. She danced. She knew all of your songs." That's how I discovered I was being watched; it was just mind boggling. He began to test me like that, too. He'd ask if any of the girls or his workers had talked about him or his business, and when I would tell him no, he'd say Well you know if anybody say anything about Daddy, I want you to make sure that it's okay to come back and tell Daddy, and Daddy will handle it. I never did. But if one of the girls saw me using the phone when I wasn't supposed to, she would go back and report, Oh hey Daddy. Asante was on the phone in the vehicle and she knows she's not supposed to have the phone on. So somebody was always watching you, even if he wasn't there. What the world would look like if we taught girls to rage? He wanted us to feel that, that he had somebody watching your every move. There's a security at the end of the gate at the house, which he said was trained to stop us. He'd threatened your family, or said they're just jealous and trying to hold you back. He instilled fear into us, and made us believe whatever he'd told us. So when I say to people that we were "held captive," it's more of a mental thing. He manipulated us into thinking we couldn't leave, or that we didn't want to. When I did leave that house, I had to gather my thoughts; everything that had gone on there didn't feel like reality to me. But once I realized that it was real, I felt I needed to do something. Especially having seen those two girls in that home, I thought that their parents could have not known what was going on and could have not been okay with their daughters being in those situations with an older man. My goal in speaking out was for those children — those girls — to go back home and live teenage lives. I wanted them to get in the kind of trouble that normal teenagers do, to fuss and fight with their parents, go to college, have the experiences that young people have, and just enjoy life. And, for my part, I had to learn to love myself, to know and to understand how I should be treated as a woman. I was upset because I sat there so long, but he I was in love with him. I had to find my way to understanding, so I could keep the promises I made to myself. 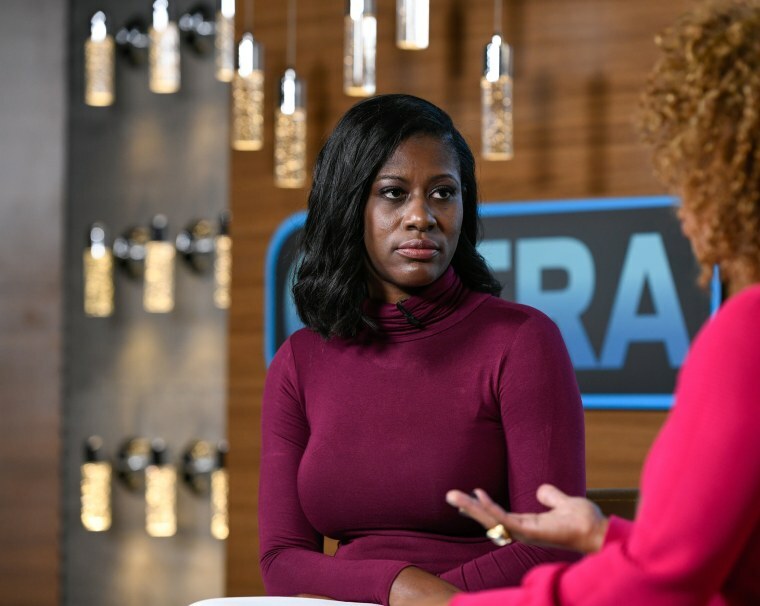 Asante McGee is an author, advocate, speaker and business executive whose book, "No Longer Trapped In The Closet: The Asante McGee Story," came out in January 2019.